About three months ago I signed up with HackerOne, and created a bug bounty program for my WordPoints plugin. I’m writing this post to document my experience with HackerOne, for anyone else who may be thinking of using it. When you first create your program, it is private. This gives you time to tweak things and gain some familiarity with the system. You also have the opportunity to invite up to 100 of the top hackers to participate and the private pre-launch program. I did invite all 100 (though not all at once), but there wasn’t any activity. That is probably because I hadn’t set a minimum bounty amount yet. Last Friday I decided to make the program public. This timing roughly corresponded with the release of WordPoints 1.7.0, which included some security fixes that I’d discovered on my own. What should you expect when you launch publicly? I got 15 bug reports in the first 24 hours, and about a third of them were probably in the first couple hours after launching. The reason for the immediate spike in activity (of which there had been none previously), is probably due at least in part to my having set a minimum bounty (though this was only $25). Of those 15 reports, most of them were low quality. The reporter obviously hadn’t read the program description, and didn’t know what kind of bugs I was looking for and what sort of vulnerabilities I would consider invalid. Of those 15, only two were vulnerabilities that actually needed fixing. I’ve received 4 more reports this week, but none of them have been valid source code vulnerabilities either. So, now you know what you can expect with your first week after launching a bug bounty program on HackerOne. I suspect that if you wanted to avoid the first-minute slew of reports, you could wait until later to set a minimum bounty amount. This entry was posted in Uncategorized and tagged Security on November 8, 2014 by J.D. Grimes. WordPress core has supported PHP versions >= 5.2.17 for a long time. And there’s been many a discussion by developers and contributors about dropping support for 5.2, making the minimum requirement 5.3. But the lead developers are standing against this move as long as 5.2 makes up a significant part of the user base. And less than a year ago it made up about 50%. We know the approximate proportions of which versions are being used because this information is available through the stats page on wordpress.org. I’ve been watching this page for a while, and I’ve caught a definite trend away from PHP 5.2 toward newer versions, especially 5.3. … just in time for the PHP 5.3 end-of-life! http://marc.info/?l=php-internals&m=140605526629324&w=2 (though for many, there will continue to be security patches for several more years, since PHP 5.3 was part of RHEL 5 and hence Cent OS 5). 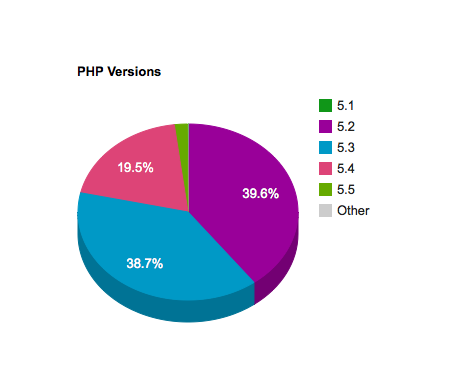 From the end of this month, around 21.5% of WordPress installations will be running on non-EOL-ed PHP versions. As you can see, this is a mixture of good and bad news. The good news is that people are moving away from 5.2, which no longer recieves security patches from PHP. The bad news is that the majority of these folks, who are moving to 5.3, will just be back in the same boat at the end of the month. And so will WordPress. It’s not that WordPress needs to drop support for 5.2 so that it can introduce cool new features or improve its performance. Sure, there may be a few ways in which 5.2 is holding us back, but they really aren’t that significant. It’s mostly that the grass is always greener on the other side of the fence. 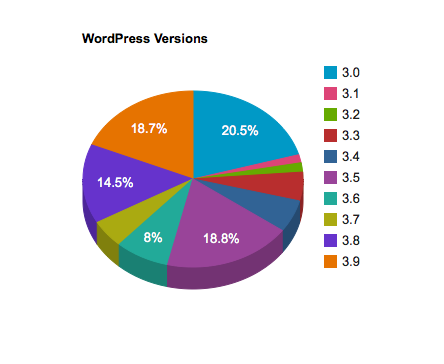 What has always seemed strange to me is that only a fifth of sites are running the latest major version of WordPress (3.9). It makes me wonder what the breakdown of PHP versions is relative to WordPress versions, but if I remember correctly, we’ve been told that it’s pretty much the same as overall. The maintained WordPress versions (3.7, 3.8, 3.9), make up only about 38% of the live websites it’s running on out there. In other words, 62% of WordPress sites are vulnerable right off the bat. And, what really strikes me, is that WordPress 3.0 continues to maintain a larger portion of the market than any other version. Oh, there’s a new version of WordPress. Updating takes time though, and what if something goes wrong? I hear there are new features, but do I really need them? Nah, my site is running fine, it isn’t worth the trouble. And in that case, it really doesn’t make sense to update. It’s those security patches that push updates from the trivial to the must. That’s why I wrote a post asking plugin developers not to add backward compatibility code to support older WordPress versions. Basically, nobody should ever be running those versions. Which brings us back around to the unmaintained PHP versions that most sites are running on. Should WordPress continue to support these versions? You might think I’d have to say “No”. But in this case, it’s a little more complicated. People know they are running WordPress (at least most of them do), and they either know or could easily find out what version of it they are running. But PHP, well, most people don’t know what on earth that is. And even those that do often have no control over what version they are running. In other words, it is up to the web host. That doesn’t mean WordPress couldn’t drop an older version of PHP. But it means that if it did, people who use WordPress would panic, because they don’t really understand what is happening, why it is happening. And most of them have no control over what version of PHP they are running. So, you’d have to tell them to contact their host. But their host may or may not be able to just provide a newer version of PHP with a snap of the fingers. In other words, dropping a PHP version that 40% of sites are running on would probably alienate a lot of users, who are using WordPress precisely because they don’t have to worry about all of that technical stuff. But does that mean that we have to put up with hosts running dead PHP versions “for the sake of our users”, when that is possibly making those same users’ sites more vulnerable? In other words, it’s the same false argument being used by folks who don’t feel like updating WordPress: I don’t really need the features, so it isn’t worth the trouble. Of course, there is a difference. WordPress isn’t responsible for whether a user’s hosting is secure, the host is. And, as David Anderson pointed out, many OS’s and hosts will be providing their own security patches for PHP. In other words, the equation is much harder to solve than it looks. Offering security updates for WordPress, and hoping hosts patch their PHP, may indeed be the best course of action. This entry was posted in WordPress and tagged PHP, Security on August 5, 2014 by J.D. Grimes.